The Challenge brand is well known for excellence in innovation, reliability and durability. The EH-3 model of paper drills have been the industry-standard for over 40 years, with over 50,000 units sold worldwide. The rugged steel and cast iron design of the EH-3 provides accurate drilling for years to come. Powerful hydraulic operation minimizes operator fatigue and results in consistent, clean holes. The taper-fit shank design ensures that our drill bits will seat centrally and securely into the spindle. The EH-3 can drill 25% more stock on every stroke with its standard 2-1/2" drill bits. The EH-3 utilizes an automatic-return of the drilling heads as standard equipment, minimizing the contact between the drill bits and the drilling block. This allows for longer intervals between sharpening and longer bit life. The Challenge EH-3 proudly displays the UL label, providing added assurance of our quality and safety. Proudly manufactured in the US, the EH-3 continues the Challenge legacy of providing assurance you made the right decision. Range Between Bits: 2-3/4" to 4-1/2"
Range between outside bits: 5-1/2" to 9"
Table size: 19-1/2 X 31-1/2"
For more than 45 years, the EH-3 has been the standard by which all other drills are compared. The legend continues?Cast-iron and steel construction ensures years of trouble-free operation. Integrated chip chute directs scrap to the rear-mounted waste bin. Individual head height adjustment. Overall height adjustment. 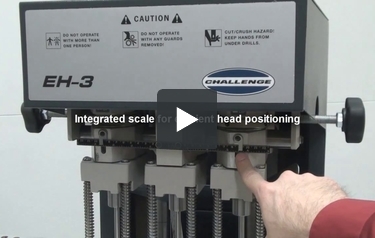 Integrated scale for efficient head positioning. 2-1/2? (63mm) drilling capacity in one powerful stroke and automatic return of the drilling heads. Since its inception. The EH-3 has personified strength reliability and assurance you made the right decision! If you've ever tried to use a traditional three-hole punch to process hundreds of pieces of paper, you know that it's tedious. (Not to mention time-consuming.) However, you can speed the process up by using a hydraulic three spindle paper drill such as the Challenge EH-3. Here's some information about it so you can determine if it's right for you. The EH-3 has a terrific drilling capacity. This device is capable of drilling through 2.5 inches of paper so you'll be able to process hundreds of sheets very quickly. Only one stroke is needed to punch the paper so you won't have to keep drilling to get the results you want. You can even control the speed of the stroke if you want. At the top speed, this device will deliver 18 strokes per minute. If you want to work with larger sizes of paper, the EH-3 would be a great choice. This device has a table that measures 19.5" x 31.5" so you can easily process larger sheets. This is a three spindle drill so you'll be able to drill three holes at once. Using a device such as this is far preferable to using a one spindle machine because you don't need to drill the paper multiple times to get the hole pattern you want. Plus, each hole will be cleanly cut so your documents will look great. The EH-3 operates hydraulically which is great because that means it's easier for you to use. You don't have to put out much effort to use this device so even if you're working with a lot of sheets, you're less likely to get tired out. The EH-3 will automatically remove the paper chips for you. It will also return the drilling heads to their appropriate positions so there won't be a lot of contact between the drilling block and bits. This will lengthen the life of the bits so you won't be constantly purchasing new ones. This device is incredibly large so you'll want to make sure you have adequate room for it before investing in it. You can feel good about buying this device because it's made in the United States. When you purchase one, you'll be supporting American workers and this country's economy. The Challenge EH-3 is a fantastic hydraulic three spindle drill. This device is solidly built so you'll definitely be able to get a lot of use out of it. (And if it fails, you've got the excellent three-year warranty to fall back on.) Since this machine has three spindles you'll be able to produce a three-hole pattern quickly and easily, and the device's table is big enough to support larger sizes of paper. And even though this device is big, you'll find it easy to use. All in all, the EH-3 is a really impressive machine, so consider getting one for your workplace today. What's the actual weight of this drill? Thank you for your question. The Challenge EH-3 Hydraulic Three Spindle Paper Drill weighs 525 pounds. How far can I go in a with a sheet of paper when you remove the guard ? Thank you for your question. The maximum depth of margin you would be able to set with the Challenge EH-3 Hydraulic Three Spindle Paper Drill is 5 inches. Thank you for your question. The Challenge EH-3 Hydraulic Three Spindle Paper Drill does not have corner rounding functionality. You can find our selection of Corner Rounders here .